Caryn Antonini, who grew up in New Canaan, launched Early Lingo in 2011, a DVD series for children to learn foreign languages starting at six months old. Antonini, who grew up in town, graduating from New Canaan High School in 1990, herself spoke multiple languages as a child. Her parents, Penny and Marion Antonini, who still live here, are of Danish and Italian descent, respectively. She said her father spoke several languages due to his work and travels— Portuguese, Spanish, Italian and Swiss-German — and when there were visitors in their home from Brazil, speaking Portuguese, she just picked up on the language. She studied both French and Spanish while at New Canaan High School and then graduated from the Georgetown University School of Languages and Linguistics. It was there that she cultivated her understanding of a child’s acquisition of language and the relationship to their cognitive development. The germ of the idea for Early Lingo was actually cultivated back in 1994 as a software program Antonini developed, but it was never produced. Years later, she knew she would want to give her own child the advantages of learning a foreign language as an infant, and all the subsequent benefits it would bring to that child later in life, but was unable to find anything on the market that would accomplish this effectively. So, in 2008, she revisited her original idea. In order to begin to produce her foreign language for kids DVD series idea — combining both animation and live action — she set out to find an editor and a cameraman, “which is not a problem, living in L.A.,” she laughed. The hardest thing was finding an animator. “It took me a year to find one I liked and I hit the jackpot with Lon Levin,” Antonini said. It took another year-and-a-half to develop the first DVD and she launched the series in 2011 with three DVD’s for learning English, Spanish and French, adding German, Italian and Mandarin Chinese this year. The Early Lingo Series is organized into 12 familiar everyday activities, featuring JoJo the monkey and his pal, Lulu the bird. Each DVD is a mini-adventure using relative words and expressions that engage the child. “Children can watch anytime, anywhere without the need for adult interaction or supervision. However, we encourage the parent or caregiver to participate alongside the child,” Anotnini said. With Early Lingo’s use of the Total Immersion Method, the child is immersed immediately into the target language with no use of translation — proven to be the most effective and natural method of learning a new language, and not at all unlike how Antonini picked up Portuguese as a young girl. 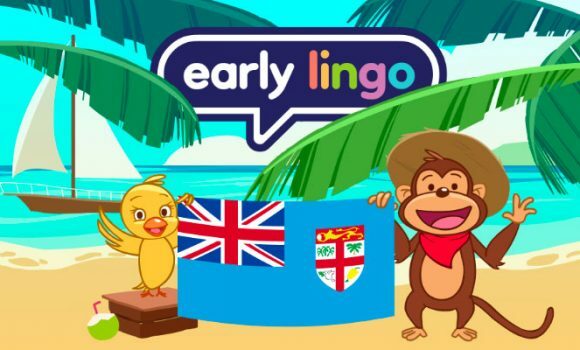 Early Lingo uses native speakers who articulate, speak slowly and use comprehensible words and phrases that are easy for the child to understand. “The narrative approach is what fascinates the children most and keeps their attention,” Antonini said. She used Cristiano to “test-run” the first three DVD’s, she said, and she still runs Early Lingo adventures by him and his friends, making “constant adjustments,” she said. Nearly three months ago, Antonini and her husband, Cliff, welcomed another son, Nicholas, so she will soon have another test monkey (pardon the pun) for her series. Early Lingo is available for purchase in New Canaan at New Canaan Toy Store and Elm Street Books, as well as on Amazon.com and Yoyo.com. To view this article in its complete version, please visit the NC Advertiser website. When will 7-12 be available?